Tom Cochrun /Light Breezes: Confessions of a Radical? Surely many of you heard or took part in debates about "trusting or changing the establishment." Establishment was the cultural shorthand for the power elite, especially what later generations of politicians came to call "Washington and Wall Street," Eisenhower's "military industrial complex" or even more recently the swamp. 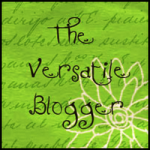 It was also about how we lived, loved, thought, and behaved. Change it from with in or by revolution? My brothers, pictured above, were inclined to revolutionary change. As their older brother I was already invested in journalism, observing and reporting and had been since high school. We had lively debates often joined by our parents both of whom were political veterans, studied people in addition to being WW II participants. There was no "generation gap" as such with unfixable fissures, but our family had a diversity of opinion. John, on the left, two years my junior was of the SDS/Weather Underground mind set. Jim was simply the brightest of the three and a poet philosopher, free spirit and gentle soul who broke with convention in almost every way. I guess I was a pragmatist, relying on reason. 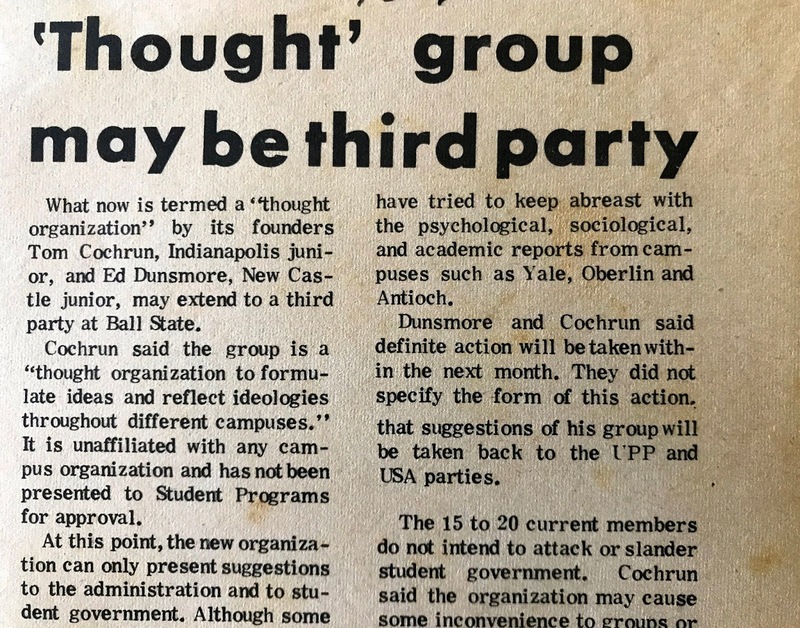 the evolution of a "radical"
My involvement in campus politics (that candidate for class senator on the far right is a baby version of your blogger) combined with my professional work as a street and police beat reporter in Muncie edged me in my own direction. I would sometimes ride with cops on a Saturday night as they rounded up drunks and broke up fights, which in blue collar Muncie was a full deployment. The way some of the detainees were beaten with night sticks seemed at odds with the sociology courses I took. It was the mid '60s and the Klan still marched, and blacks were denied access in some establishments. I covered sit ins and marches and got tossed down stairs by a Klan leader. All of this was a vastly different world than my beautiful campus and the vibe in the fraternity house. I began to cogitate. Academia would not, nor should it, insulate. Like the world, our campus was changing. I raised issues of equality and civil liberties in Student Senate where I served my freshman and sophomore years. 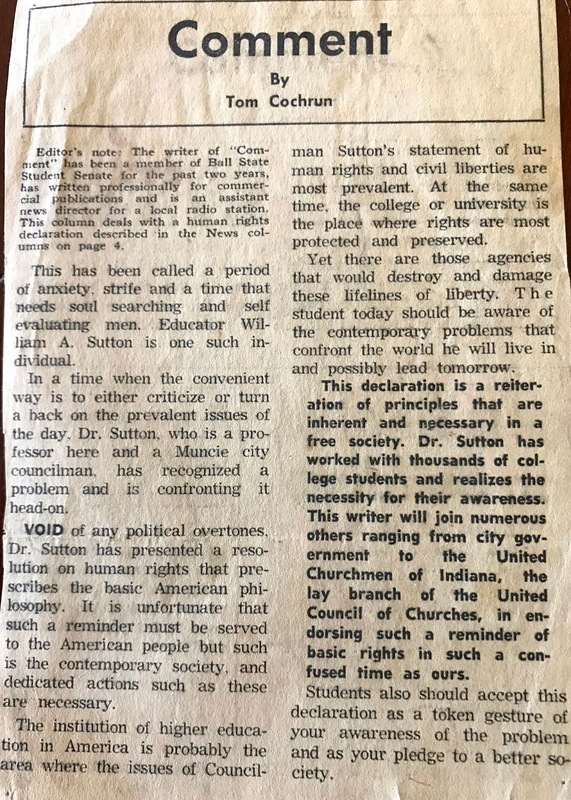 I got behind a Professor's declaration of Human Rights-ground breaking and long before feminism and LGBTQ entered the public mind. It was at a time when blacks were treated as less than full citizens in housing, banking and access. The writing seems a bit leaden and ponderous but it was 50 years ago and I was a kid. I became an advocate for the abolition of dorm hours-that moved me onto the "radical" list. Colleagues in the long and complex battle to eliminate women's hours were Jeff Lewis, Jon Hughes, and Jim Davis. Jeff went on to a vibrant career in public policy, marketing and later in opinion research. Jon became a noted photographer, writer and professor who drove the establishment of a journalism school at the University of Cincinnati. Jim Davis is the creator of Garfield the cat and presides over the Paws empire. Butting heads with a University administration and government was a tall order but we were eventually successful. That changed the campus landscape and culture. 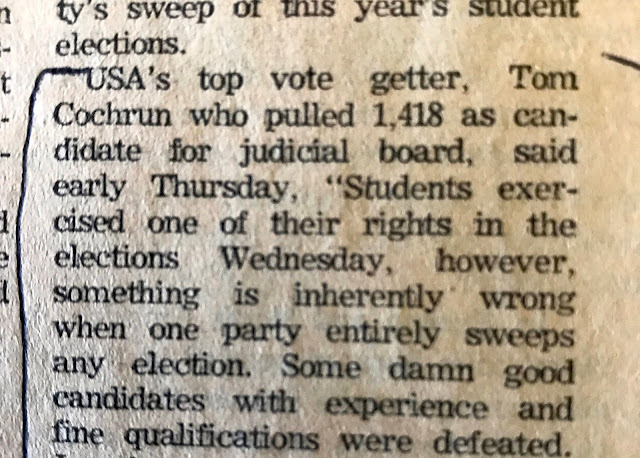 I ran for the University Judicial Board (Supreme Court) my Junior year. I felt restrained by the traditional campus parties and sensed the world was changing more rapidly than we were responding. The Judicial Board in my senior year would be a way to move ideas. The 1968 political campaign loomed and there were explosive issues of war and peace, civil rights and change that stirred me. "get clean with Gene", Senator Eugene McCarthy, the anti war democrat. John worked for McCarthy and above is seen serving as a body guard and beer drinking pal of actor Paul Newman who campaigned for McCarthy. I suffered my first campus election defeat that year as our party was swept by a vigorous opponent. I came back my senior year with different ideas. I had been studying the emerging intellectual political movements of Dadaism, Herbert Marcuse, the Provos of Amsterdam, the Diggers of San Francisco, intellectual anarchism, Rudi Dutschke, Daniel Cohn-Bendit and others. 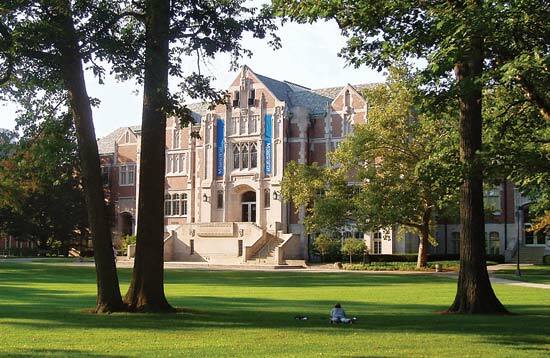 All of that was a far stretch for a state university in the mid west. A ready ally was a fraternity brother who may be the deepest thinking and most intelligent person I know. People still marvel at how he ate through Philosophy classes and professors. He went on to a fine career serving as an attorney, prosecutor, Judge and just maybe the Rolling Stone's greatest fan. He's traveled the world to see them. 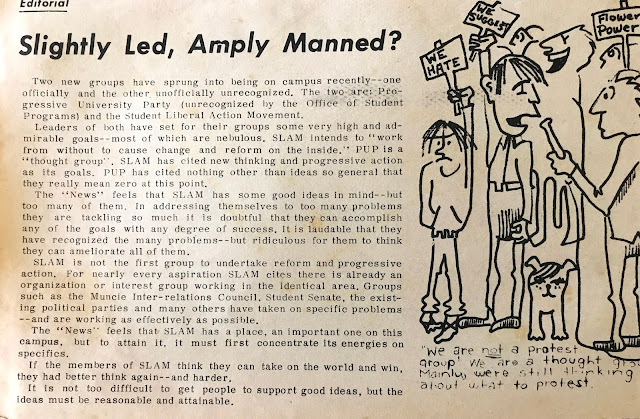 Ed was always up for a good joke and we thought we'd try to introduce a few "new ideas" to what we saw as the moribund political culture on campus. We created PUP-the Progressive University Party. We got pilloried by the campus newspaper. In the cartoon below-Ed is portrayed as speaking to the reporter. I am the pup. The editorial was more precise than the cartoon. We had in fact accomplished something. We were able to "unite" a divergent group with a unified objective. The historic arts building displayed a giant US flag on a main hallway. The flag was old, dirty and even a bit frayed. 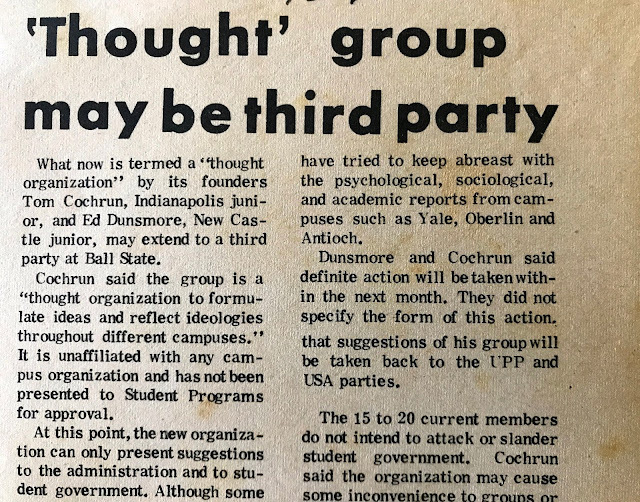 PUP was able to get cooperation from the conservative Young Americans for Freedom (YAF), the Young Peoples Socialist League (YPSL), Young Republicans, Young Democrats, the fraternity council IFC, sorority council Panhellenic, the Newman Society and others, that the issue of the flag should be addressed and something needed to be done. The flag had been there for decades. Ed and I took delight in thinking we were able to bring all of the extremes and different groups together. We though PUP would be politics with a sense of humor. These are notes from one of our brainstorming sessions as we began to articulate what would become our manifesto. We would not have signed off on all of these-in fact the fight over what to select would be interesting, but this demonstrates the range of thought in our "thought group." 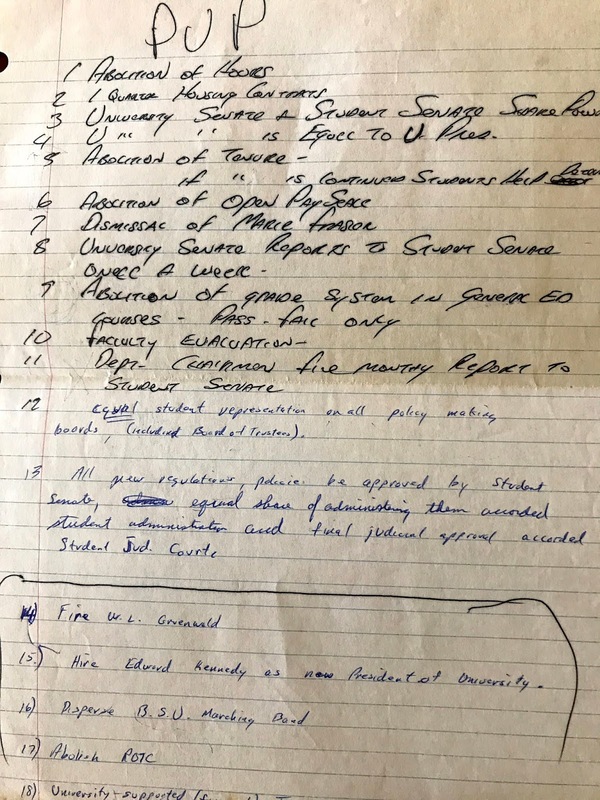 Abolition of Hours, one quarter housing fees, pass fail in general education courses, faculty evaluation, equal student representation, discussing changes in tenure and department chairman reports hold up as solid ideas. everybone in my face and would have bled to death had it not been for fraternity brothers and a Muncie police officer who was also a Ball State student. I was in a coma for a while and when I came back to campus I struggled to graduate, work and get healthy. My days of "radical" politics were over. After that I spent almost 5 decades in journalism and broadcasting and left the politics to others. 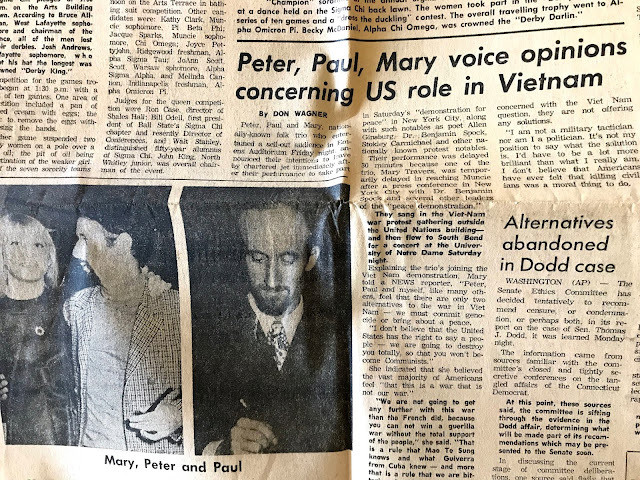 I came across these papers in an old file as I have been working to organize some of my archives for the Indiana Historical Society that has curated some of my early journalism and investigative reporting. 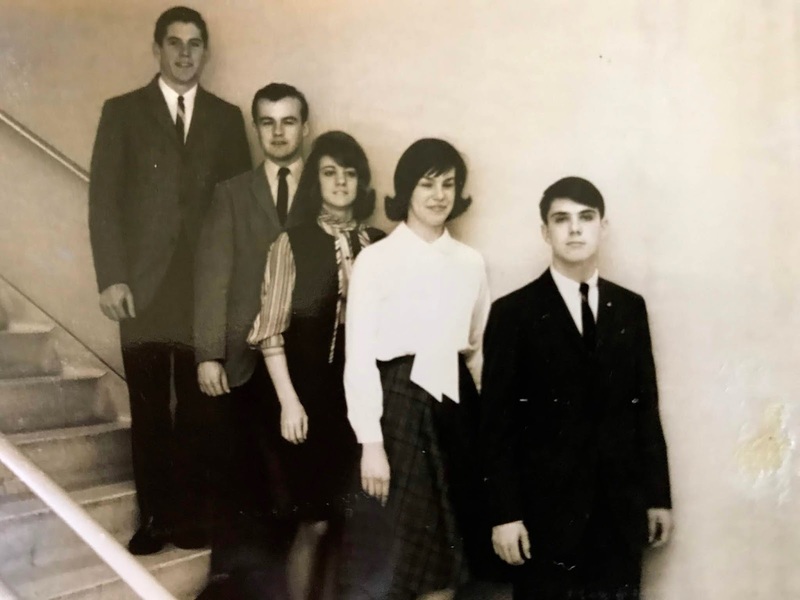 A few of us from that era were together recently and we concluded the late 60's were without precedent and peer. From here it all seems so playful and hopeful. Lana's green ways delivered us another bountiful year of our beloved fava beans. 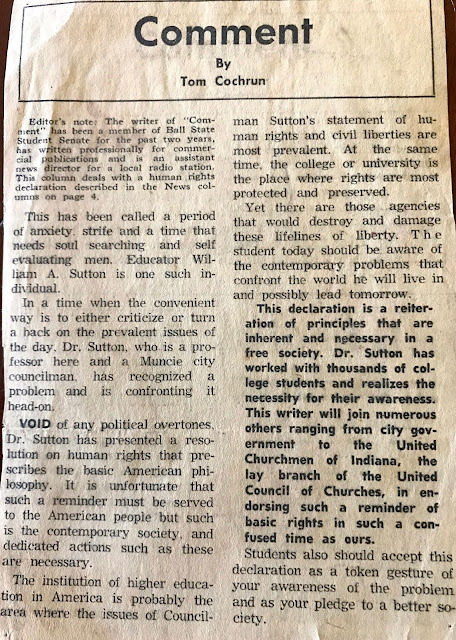 When I was a kid in Jr High a friend's older brother was the editor of the Dakota Student, the newspaper at UND. 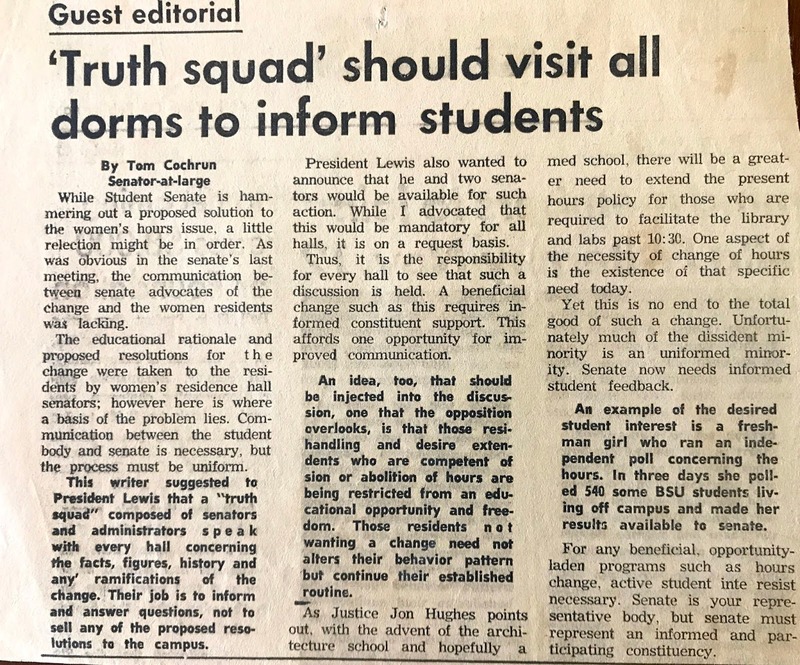 Students had been lobbying for a couple of years, this was in the 50's, to have some input into the entertainment brought to the campus. The faculty and the administration wouldn't budge. The school booked Sy Zentner and his orchestra for homecoming. My friend's brother wrote an editorial condemning the faculties choice and urged student to blow off the homecoming dance. The faculty advisor got wind of it and told the printing department not to distribute the papers. Ted's brother and his fellow campus news people broke into the printing office and distributed the papers themselves. Ted's brother got kicked out of school for a semester. The Zentner homecoming was a bust and the school began to allow student input into the concerts and speakers. Ted's brother was one of the first Air Force pilots killed in the Vietnam war. 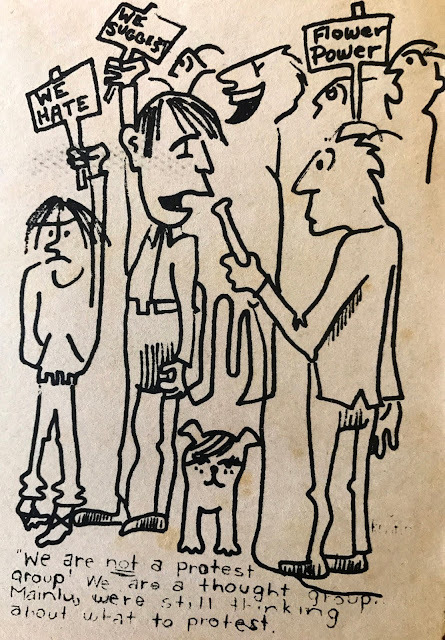 I was doing a "man on the street" in Bismarck in the mid 60's and stopped Sy Zentner for his opinion on whatever the subject was. He and his band had done a concert the night before. He was most cordial. I knew who he was on sight but still asked him for his name and where he was from. Probably the only man on the street in Bismarck, North Dakota, who ever told the interviewer he was from Hollywood, California! Yeah, Jager's comment sounds akin to when Arcadia High selected Les Brown and the Bank of Renown for the prom in 1968. We were into the Beatles, Stones, etc. Of course, today, I'd rather listen to any big band than the rock stuff of those days. My tastes have changed. However, I can guarantee you that the cats on Si Zentner's band were getting high on the ban bus on the way to Jager's homecoming gig. Some of them (in their 80's) are still swinging hard. I have forgotten so much of your activism during those years. I was a late bloomer, and didn’t appreciate your courageous efforts at the time. My conciseness didn’t develop until later. I am still proud of who we are, and what we stand for! I was not part of your 'set' as it were, and in fact missed over half of '68, being out of the country. 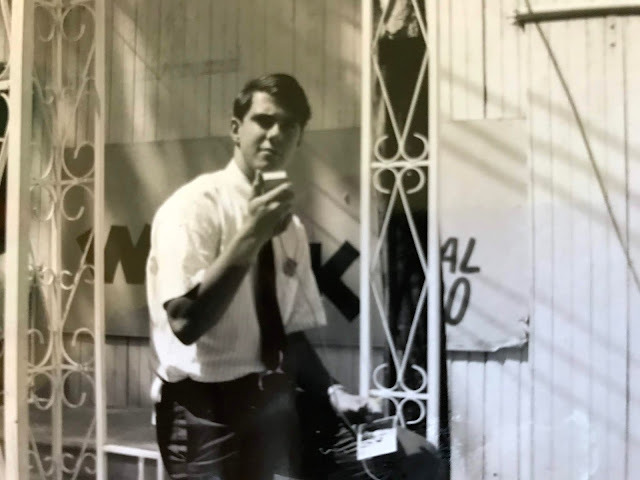 My first venture into political action was working for RFK's campaign in San Diego, awaiting discharge. His murder turned me away from politics, though I did belong to VVAW, which was loose-knit, to say the least. The next think I knew it was 2007, I had three grown kids and was retiring from a career in medicine. All for the best I suppose. You've had a fascinating life so far, I predict more awaits. A wonderful history with such rich detail about the Sixties which we all experienced in different ways and have all recalled in different memories. Having just returned from a college reunion in which we swapped stories about politics, the impact of Vietnam and rules about women in dorms, your stories had a great resonance. Thanks for sharing them. Great article, Tom. I am a 1969 graduate of BSU and relish the memories. Was at emens auditorium the night that Senator was there running for president. The same evening that Dr. King was murdered. Best wishes.